Aircities are Slipping. Dragons have Returned. Anderax Grayvenhorn has spent his whole life traveling to the aircities in his parent’s dirigible, with one dream… to climb a real tree. When his father, an aircity inspector, is sent to learn why these floating towers are starting to slip through the clouds, Anderax discovers the dark truth of their power source, and is pursued by the soul-stealing Archangels. As tensions rise, he finds the key to saving the aircities and the dragons is not a destiny of war, but to become one of the legendary Peacecrafters. 1 – How do the air-dwellers deal with running out of airdrainium ore? How does that affect the world? 2 – How does Anderax deal with both sides to prevent war? 3 – What are the different personality traits of the cadets and how do they relate to the dragons? 4 – Who is the Nightraven? Why do you think the Nightraven has been sneaking around? 5 – What do you think it would be like to live your whole life in the sky? 6 – Would you like to live in the clouds? Would you rather live in an airship, or on an aircity? 7 – What color dragon would you want to ride? What type of land would make that color? Gear Bookmark and handmade Gear Pin included with each book! Signed books make great gifts, even for yourself! 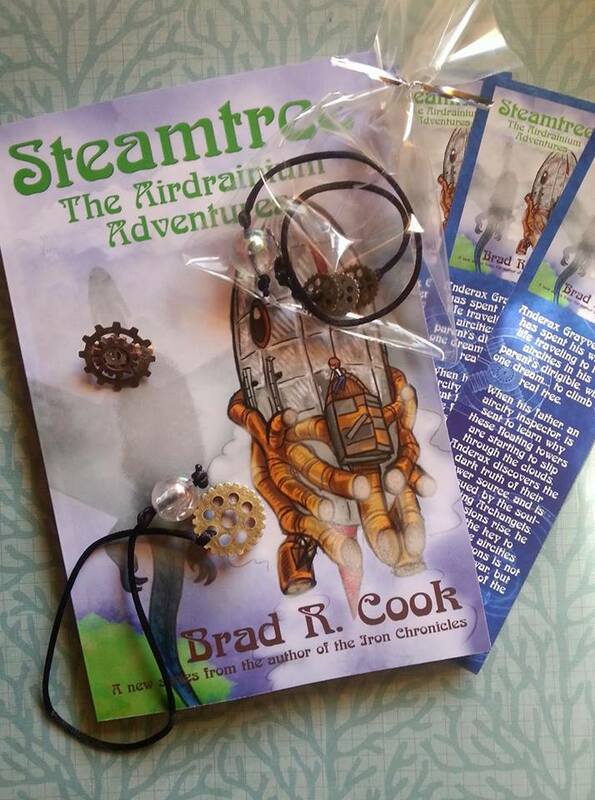 Read the first two chapters of Steamtree, with illustrations.